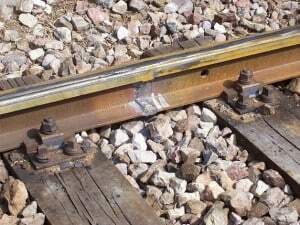 Long Welded Rails is welded rail in which central part does not undergo any longitudinal movement due to temperature variation. A length of greater than 250 metre on Broad Gauge (BG) and 500 metre on Metre Gauge (MG) will normally function as LWR (Fig). The maximum length of LWR under Indian conditions shall normally be restricted to one block section. The portion that undergoes expansion and contraction is known as breathing length. Steel rails experience longitudinal movement due to varied temperature conditions. To compensate this movement in long welded rails, expansion joints are placed at certain distances. These joints have pre-calculated expansion gap to allow longitudinal movement of rails, thus preventing thermal stresses. N = Ps / R, where “R” is resistance per sleeper. Determine the minimum theoretical length of LWR beyond the central portion of a 52kg rail would not be subjected to any longitudinal movement due to 30 degree Celsius temperature variation.